So What are the standard frame sizes? Interestingly enough there should be no such concept as Standard Frame Sizes since the standards are not really applicable to frames. I'll explain why and will also talk about recommended sizes and tips on selecting the right frame and show some examples. Well for one - frames are made to hold objects and for simplicity I'll only talk about pictures and art (paintings, drawings, watercolor...) here. So its really the object size that determines which frame you want. Then the frames are made to enhance the presentation of an object such as painting and different manufactures that produce frames have thousands of designs and styles based on their understanding of the common trends and demand - and if the inside frame dimensions will most likely be set in such way that an object with a standard size (pictures or art) will fit inside of it the outside dimensions can vary drastically. So there you have it is the pictures and art that have standard (commonly used) sizes frames do not. When people talk about frame sizes they really talking about the size of an object that can fit in it but not the actual frame size. 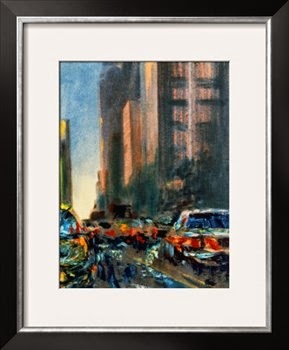 So what is the best way to select a picture size or an art size where pre-made frames will be readily available - thus a custom (more expensive) frame can be avoided? With pictures it is very easy since they follow more stricter guidelines as far as the picture size. You will hardly ever find a picture that was custom made and is not a one of the commonly used sizes. Thus, you can simply visit a store where you print your pictures or a store where you plan to buy a picture frame - all the frames you will find are created for standard pictures sizes so you just pick one that you like. Anything larger and we are talking about customer orders, canvas prints from a photograph and other things that actually fit into the 'standard' frames for art category below. Here is the post that covers standard canvas sizes and pictures sizes. And this post covers European standards and has some other useful information. Well first thing first - take a look at what decor you have where the painting/picture will be hung. 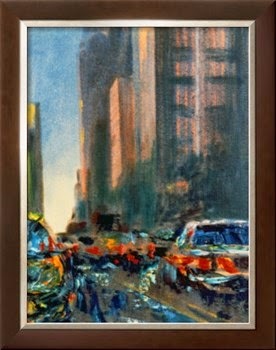 Obviously you will most likely need a frame that will fit well with the surroundings - e.g. most of the time classic frame will not go well with modern decor. Then, how big is the space (wall) relative to the painting/picture size - even if the painting is not very large you can use wide frame (wide mat) to make it appear much bigger - see example below - a slimmer frame will make it appear smaller. Assuming the wall is large, your art is small and its a single peace of art on the wall - you want as wide of a frame as possible to make it appear larger. 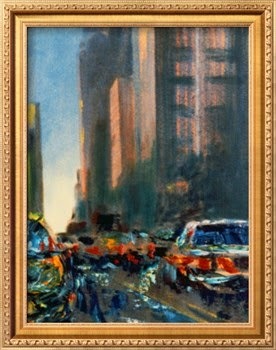 However, I recommend to keep the frame width to no more than 1/5 of the longest dimension of the painting. E.G. if you painting is 16 by 20 inches then the frame should not be more than 4 inches wide from the edge of the painting to the edge of the frame. Then check how deep the frame is. Some frames are not deep enough to handle stretched canvas - the inner frame for the canvas can be for example half or full inch - you need to make sure the frame dept is the same. And for canvas board or picture it will need to be very shallow. If you have a standard size painting (or picture) you can find very nice frame for a fraction of a cost at a garage or estate sale. Simply replace the painting that is already there with your painting. A golden heavy frame (wide, lost of details, used to be common in palaces) usually associated with classic style and royalty- a slick black thin metal frame (half an inch for example) with modern style. In the end my advise is: You see a frame you like - buy it, this is all that is to it. You can easily see that the last frame is much wider than the first two and the painting inside appears to be larger but it is the same size painting in all thee frames. Also in third frame the white boarder makes painting stand out more. So frames are all about presentations.